Leveraging cross platform app development mitigates traditional development challenges. For example, building native mobile apps for multiple mobile devices and operating systems can double or triple the amount of resources and time necessary to develop business apps. With new devices launching rapidly, a myriad of screen sizes and form factors, and the BYOB phenomenon, developing separate native apps for every business process is now viewed as a losing proposition. Survey shows developers are moving to cross-platform mobile app development. Native mobile apps are written with specific platforms and devices in mind. While these can be preferred for complex consumer-facing apps, they generally take longer to develop, are more expensive to create, and require experienced developers with knowledge of various coding languages. As a result, they are not ideal for internal business applications. Cross platform hybrid apps are a common choice for building enterprise apps as they often leverage rapid mobile app development (RMAD). These are low-code development tools that quickly build business apps using a single code base, and puts apps in native device wrappers for the developer. These apps run on mobile devices of all types. Alpha Anywhere is a leading rapid mobile app development platform with built-in features -- such as data integration, GPS, rich media capture and offline capability -- that business application developers require. There are many platforms and frameworks available to organizations looking to develop cross platform mobile apps. When selecting one of these tools, organizations should keep the following features and considerations in mind. Touchscreen adaptability – app takes advantage of touch screen capabilities while remaining compatible with devices that do not have touch screens. 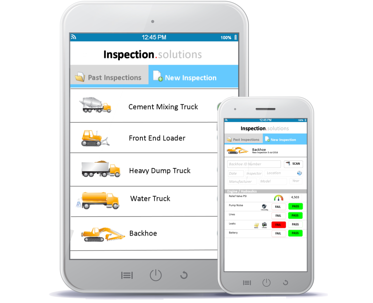 The Inspection Solutions app is an example of a cross-platform mobile app. You can view a description and screeenshots of this cross-platform app, as well as a video tour, here. Alpha Anywhere allows you to quickly build and deploy mobile and web applications. These highly secure applications run like native applications on both personal computers and mobile devices. With built-in mobile app capabilities, developers with or without mobile development experience can rapidly create robust mobile apps in significantly reduced time than with competing methods using a single code base. With Alpha Anywhere, you will find a complete and cost-effective mobile development and deployment platform. Once you build your app with Alpha Anywhere, Alpha Cloud enables one-click deployment for your apps, enabling you to keep your business applications safe and secure while speeding them to end-users’ mobile devices. In addition, Alpha Software offers a range of mentoring, training and professional services to help you speed and scale cross-platform mobile app development at your organization.